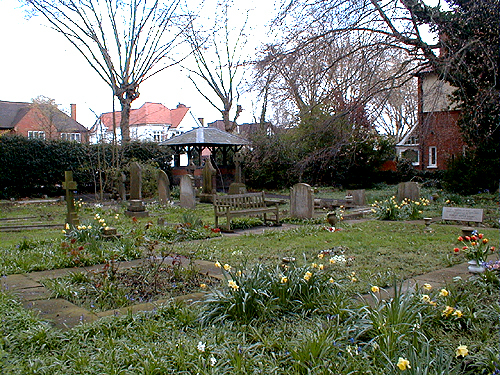 The original plan of the churchyard was drawn up in the 1960s when there were appointed Guardians of the Churchyard. In 1988 a Working Party set out in earnest to try and correlate the information in the five Burial Registers with the actual graves and give each grave a number. This task was taken up again in 1998 when computerised plans of the churchyard were produced and an alphabetical list of the people recorded in the Burial Register prepared. There are about 1000 graves identifiable in the churchyard commemorating the lives of over 4000 people. A booklet 'Churchyard Records 1864 - 2000' was completed in February 2001 containing complete listings of all burials and interments since the foundation of the church. A copy of the booklet is kept in the church office. There are plans of all recognisable graves. In the early millennium these records were put into an online searchable database on the church website, Churchyard records - search by surname or year. The database can be consulted by relatives and friends of the deceased who wished to find details of the burial, and if listed, the location of the grave itself. It might also be useful for those interested in the history of the churchyard and the Hampton Hill area, and possibly for other research. There is a plan of each individual grave in the churchyard with the name and number. To assist searches for individual graves, the plans are divided into areas A to G. This division is shown on the Plan of the churchyard areas. For Area G there exists a separate plan with names only but it is not entirely accurate and we are unsure of its origin. The earliest burial in this record is that of Walter Richard Daines, aged 11 months, in 1864. This is in Area A near the noticeboard on the corner of Park Road and St James's Road. In the early Registers there are records of a considerable number of children who died due to bad housing and insanitary conditions at that time. In the earliest Burial Register the area is known as New Hampton and only changes to Hampton Hill in 1881. The plans of each area, eg Plan of Graves in Area E, show the numbering of the graves. The numbering of rows is not the conventional left to right, but instead follows a right to left order which conforms with the original listing. The page, (or pages), following each plan, eg 'Names in Area A' list the graves in order with the names of those interred or commemorated in it. Special graves are marked with the letter S in the notes column in the List of Names. Brief notes on these special graves are on the page Churchyard graves notes. The Garden of Rest (scroll down to the bottom of the linked page for details), sometimes called Garden of Remembrance, Area H, is used solely for the interment of uncontained ashes, with no individual markers in it. Area H is a special area within Area B, as the plan of area B shows. It is well marked and tended, with a small garden at either end. 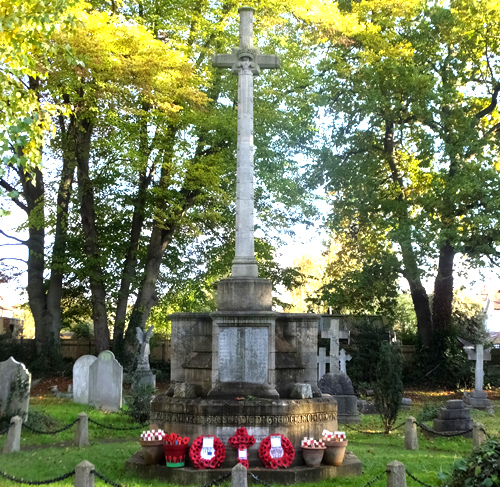 The War Memorial in the centre of the churchyard was unveiled on 26 May 1920 and features the Roll of Honour of those who died in the two World Wars. Another special area is within Area D, grave numbers 1D3, 4D7, 4D8, 5D5 to 5D14 inclusive, and 6D6. During the first world war a contingent of Canadian troops was billeted in Bushy Park, and Upper Lodge became the King’s Canadian Hospital for Canadians wounded in battle. Some died of their wounds and were buried in an area of our churchyard reserved for them. There are thirteen graves, all of a similar pattern with plain white headstones that include details of the regiment the person served in. The graves are kept with closecut grass and tended flowerbeds looked after by the Canadian War Graves Commission. A Canadian maple shades the graves, and the whole area is of particular interest and importance to Canadian visitors, some of whom were related to the soldiers. 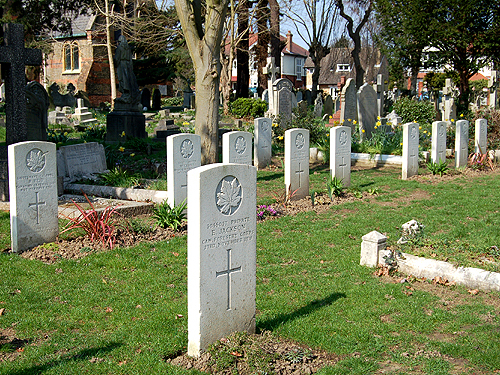 There are also five British war graves. A new gravestone for someone who died on active service or as a result of their wounds was added to the churchyard in 2016. The total number of war graves in our churchyard is 27 and at the beginning of November each year we place a wooden cross with a red poppy on each grave. Only the current Burial Register is kept in the church. The other Registers are deposited in the London Metropolitan Archives, 40 Northampton Road, Clerkenwell, London EC 1R 0MB, Tel No 020 7332 3820.